Knitter extraordinaire Rachael Burns from the UK has come up with a creative way to repurpose her Mac's power brick — you know, that big white box that keeps your computer fed. Well, those things can get pretty warm, and with her awesome knitting skills Rachael created a snuggie for her feet with a pouch for the power block. 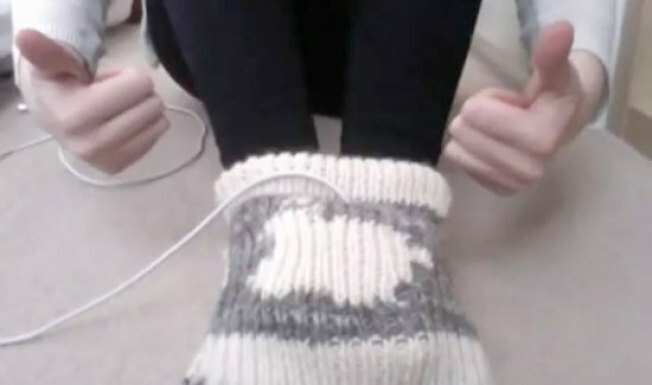 "I knitted this Apple Mac foot cosy after realising I constantly used my power adapter to keep my feet warm. It has a slot to put your adapter in," Rachael writes on her YouTube page. She also warns: "This was knitted as a joke! Your power adapter should be kept very well ventilated for safety reasons. Dont set fire to yourself please." See her demonstrating her "Sockintosh" in the video below.